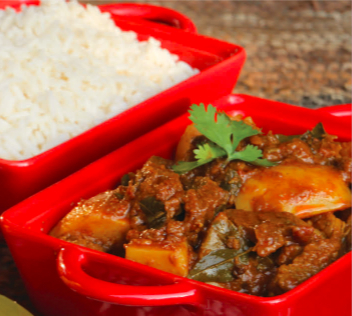 South African food is often referred to as Cape Dutch cuisine or Cape Malay cuisine, but there is so much more to the local cuisine in South African than 'bobotie' and 'boerewors'. South African cuisine is a true melting pot of different cooking styles, influenced by the many cultures living in the country. Also, due to the favourable climate, a wide variety of locally grown and harvested produce is available. 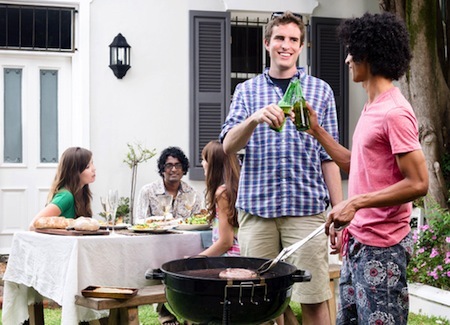 Getting together for a braai (barbecue) is a popular pastime of many locals as is going out for a meal. Going out with family and friends is also very popular and quite affordable, if compared to eating out in many other places around the world. The vast array of foodstuffs available in South Africa caters for every taste and diet and you will be spoilt for choice. 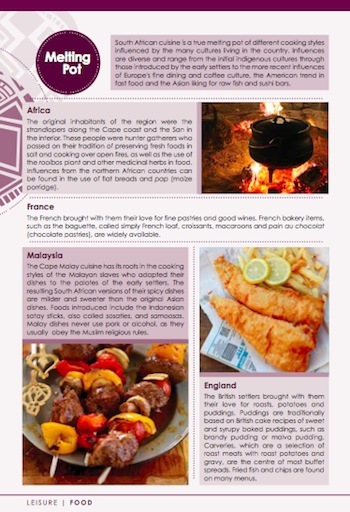 Influences in the local cuisine by the many cultures living in South Africa are diverse. 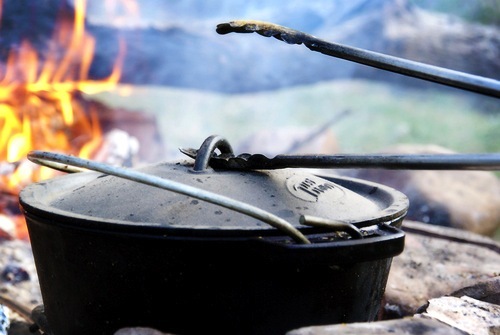 These range from the initial indigenous cultures who passed on their tradition of preserving fresh foods in salt and cooking over open fires to the more recent influences of Europe's diverse people as well as the current American and Asian food trends. From: 'Living in South Africa'. Click to view. Many meals consist of chicken, lamb, beef, pork and game, such as ostrich or kudu. Vegetarians and vegans can find many a culinary treat. Typical vegetables are potatoes, pumpkin, butternut squash, beens, carrots and tomatoes. Corn or maize, called 'mielie' by the locals form also the basis of many meals. The water is safe to drink in most areas of South Africa. In the more remote regions, it is advisable to drink bottled spring water or sparkling water, which is also widely available. Typical South African Food: Taste and Enjoy! South African food shopping is usually done at various supermarket chain stores such as PicknPay, Woolworths, Checkers or Spar. These shops are locate all throughout the South African cities. If you want to buy convenience and ready-made meals, check out fast food outlets and the various convenience stores such as Bimbo's, Star Mart or Wild Bean Cafe, which can be found at many petrol stations. In rural areas, you will often find farm stalls and convenience stores which sell a smaller range of groceries. Corner stores are often referred to 'cafes' in South Africa and this should not be confused with coffee shops. Prices for basic foodstuffs are lower in South Africa than in many countries overseas. Basis food items are VAT (Value-added-tax) exempt, but many items expats might consider essential for their diet can be very expensive and sometimes difficult to source. Find these and more events on our 'Living in South Africa' event calendar where we list the best events in South Africa for every month. South Africa not only produces delicious food but also first-class wines. Did you know, that South African wine-making traditions date back more than 350 years? The first grapes were harvested in South Africa in 1659! Most wine varieties were originally imported, but Pinotage is a true South African creation. It is a unique blend between red Pinot Noir and the red Cinsaut or Hermitage grapes. 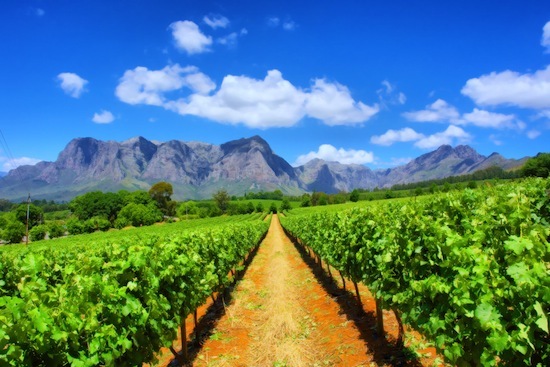 Make sure to visit one or more wine estates when touring the Western Cape of South Africa. If you want to gain more insights into South African home cooking, book a cooking class with a local chef or visit a township and enjoy some local food prepared by the community's meeting places or eateries in the township. Make the most of your experience with an expert guide such as CapeFusionTours who offer tours in the Western Cape or visit AfricanRelish which offer cooking classes in the Karoo. Looking for more info on South African food ? 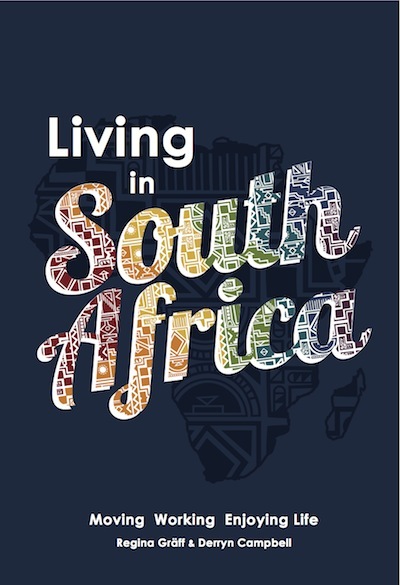 Check out our new 'Living in South Africa' guide book to learn more about the typical dishes and specialties, eating out as well as restaurant etiquette in South Africa. 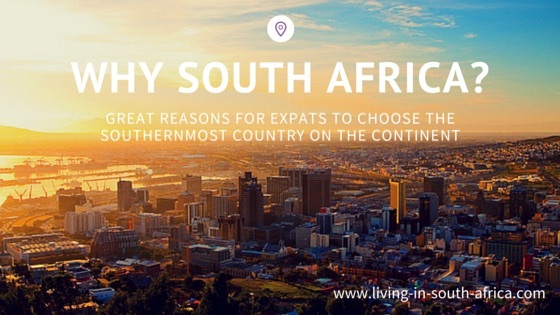 In our book you will also find plenty of resources regarding this and other important topics, when settling in South Africa. Click on the button below to find out more about the book or get in touch with us to qualify for our special online order discount. And enjoy living in South Africa! 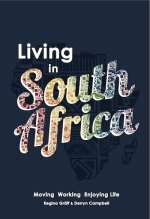 Order your copy of the Living in South Africa guidebook directly from us. Simply click on the button below and find relevant information how and where to buy the book.